The WFTO Product Label is more than just a Fair Trade symbol. It signifies not only that the practices across the supply chain are checked against the WFTO Fair Trade Standard, but it also represents support to the battle against poverty and inequality. 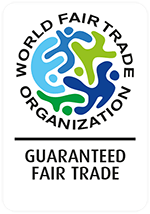 Products carrying the WFTO Label are made and traded by Guaranteed Fair Trade Organisations dedicated to the sustainable Fair Trade economy. Every purchase of products with the WFTO Label supports small producers and their communities.